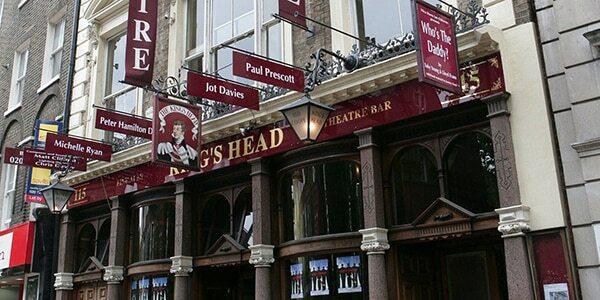 The King’s Head Theatre was founded in 1970; the first pub theatre founded in England since Shakespearean times. The theatre has presented an eclectic mix of productions including comedy, musicals, forgotten classics, and new writing. The theatre has staged works from Berkoff, Pinter, Rattigan, and Coward. Dan Crawford was the creative director of the theatre from 1970 right up until his untimely death in 2005, when his partner Stephanie Sinclaire took over. During her first year, she staged 20 galas with the assistance of Maureen Lipman, Linda Marlowe, Clive Rowe and many others. These events helped pull the theatre out of debt. In March 2010, Adam Spreadbury-Maher took over as Artistic Director. In October of the same year, the theatre announced its transformation into ‘London’s Little Opera House’; the first new one in over 40 years. OperaUpClose is currently resident at the theatre. The King’s Head also offers several opportunities for emerging artists. These include a smaller venue at the nearby Hope and Anchor entirely committed to new writing, the writing showcase Without Décor, the new opera competition Flourish, the Adrian Pagan Playwright Award and a showcase of work by East 15 Acting School students. The theatre also accept unsolicited submissions.